The small whisper (1 Kings 19:11 -13). I would have left too soon and missed Him. There is not a silver bullet. God can get our attention anyway He wants. He knows us, and if we know Him, we will know His voice. God got his attention. So personal. Humble. Not flashy. Gentle Lord and Elijah was undone. It was just what he needed. 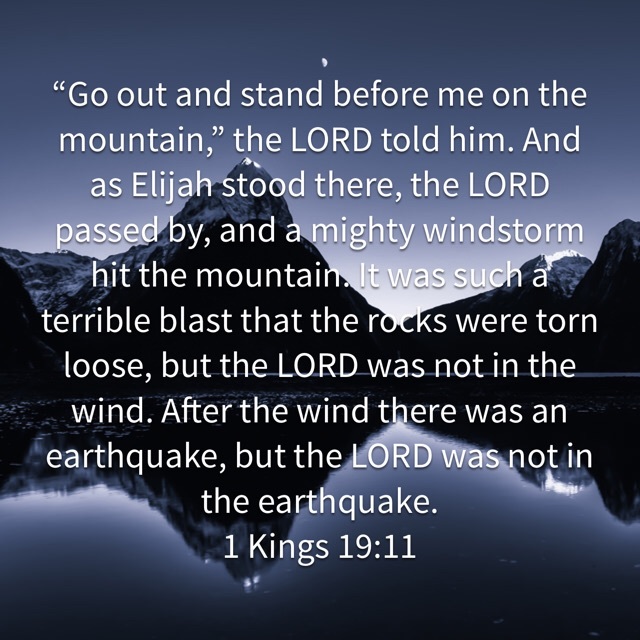 Elijah knew God was mighty (threw fire on the altar (1 Kings 18), raised people from the dead (1 Kings 17)). Though he still needed reminding. But was He kind? Was He good? Elijah needed encouragement. He felt alone in the world. Ready to give up. Throw in the towel. He needed God when he felt small and alone. And look how God met him there, discouraged. Brandi, so many things spoke to me in your post. “I would have left too soon and missed Him.” Oh, how often have I done this very thing!!! Those who are close to Him, know Him and know His voice. I need to continually seek to get close to Him. Then seeking just Him, not His stuff and what He can give, just Him. Why isn’t He enough in my life? I think I need other things, when, all I really need is just Him. He is more than enough! Love your heart! When I think of someone who is close to His heart, I think of you!